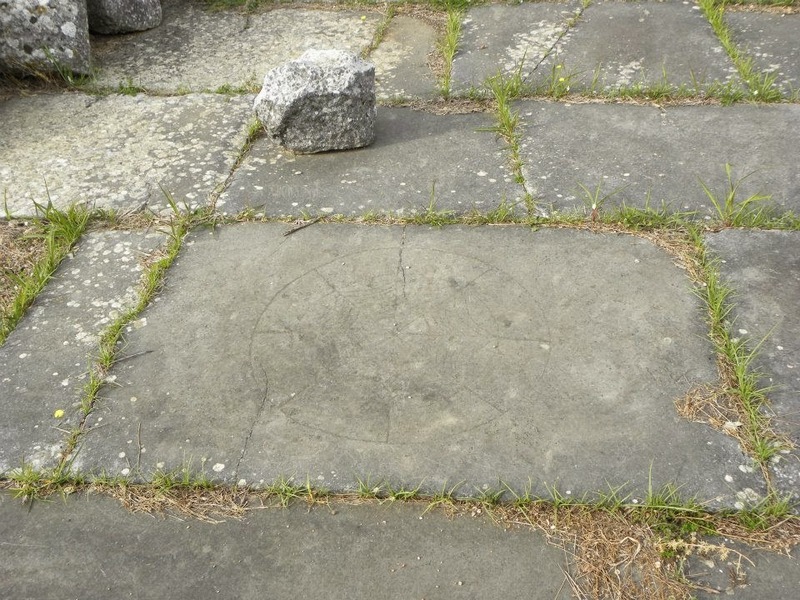 Rota is a Roman game, found carved into stones on many Roman roads and buildings around the Roman Empire. Its original Roman name is unknown. The name Rota, which in Latin means “wheel”, was given to it by Elmer Truesdell Merrill, in his article about the game, published in 1916, where he brought it to the world’s attention for the first time. Merrill also recreated the rules for the game based on other similar games and it is his rules that are documented here. Roman Rota Game in the Old Forum, Leptis Magna, Libya. Photo: Pablo Novoa Alvarez, 2011. There appears to be a description of the rules of Rota in two poems by Ovid, Ars Amatoria (The Art of Love) (lines 362-366), written in 2 CE, and Tristia (lines 481-483). What’s confusing is that Ovid says that the game is divided into the same number of sections as there were months in the calendar year. The Roman calendar had 10 months prior to the Julian reform of Julius Caesar, which is what Ovid is referring to. 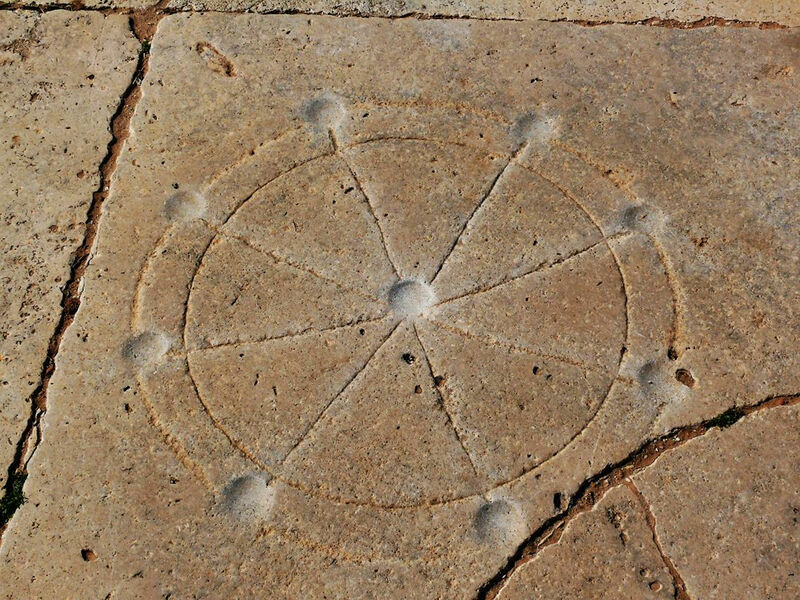 However, the boards of Rota that are found carved into stones through out the Roman Empire all have 9 cells and not 10. So it is possible that Ovid is referring to another game or at least a different Rota board variation that had 10 cells. However, he clearly says how to win the game, by aligning 3 pieces in a row. It should be noted that this description of what seems to be Rota is only valid according to J. Lewis May’s translation. According to Mozley’s translation in the Loeb Classical Library edition, this phrase refers to two different games, one of which is Ludus Duodecim Scriptorum (Duodecim Scripta), which had 12 lines, in a single section of the game, referring to post Augustan reform of the calendar with 12 months. And the other game is Nine Men’s Morris, which captured the opponent’s piece by placing two pieces around it on both sides, thus forming three pieces in a line. Rota carved into the floor tiles of the Marble Road in Ephesus, Turkey. Photo: Juan Carlos Campos, July, 2011. Another possibility of course is that in both poems Ovid is referring to a 3×4 board with 12 cells in it and 3 pieces per player, where the players had to place their pieces in any location and then move them around to make 3 in a row to win. Sort of like Tic-Tac-Toe, but with movement. In qua vicisse est continuasse suos. Latin text from Mozley, J.H. “Ovid: the Art of love, and other poems.” Loeb Classical Library. Harvard University Press (1957). pp. 144. There is another game divided into as many parts as there are months in the year. A table has three pieces on either side; the winner must get all the pieces in a straight line. English translation from J. Lewis May, “The love books of Ovid : being the amores, ars amatoria, remedia amoris and medicamina faciei femineae of Publius Ovidius Naso.” New York : Privately printed for Rarity Press, 1930. pp. 165. Latin text from Wheeler, Arthur Leslie. “Ovid: Tristia, Ex Ponto.” Loeb Classical Library. Harvard University Press (1939). p. 90. English translation from Wheeler, Arthur Leslie. “Ovid: Tristia, Ex Ponto.” Loeb Classical Library. Harvard University Press (1939). p. 91. I will leave the readers of Latin to judge for themselves what they see in Ovid’s text. 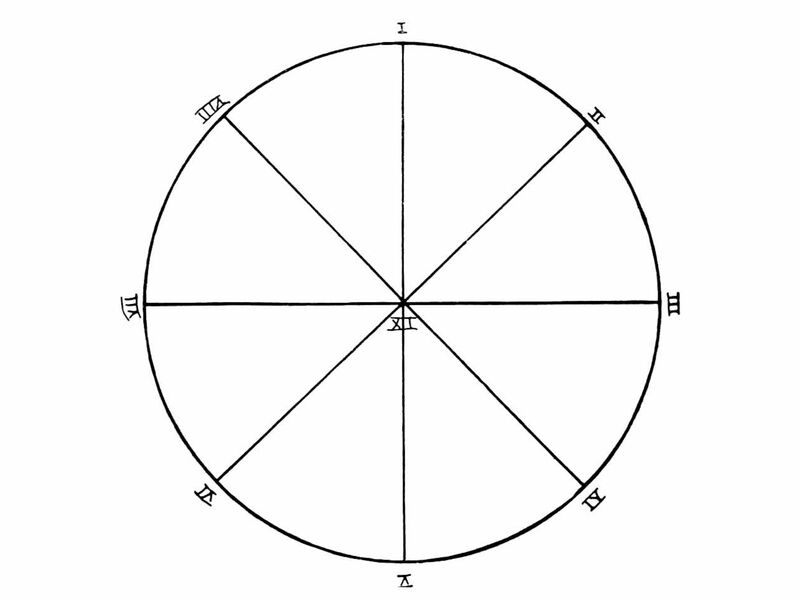 The board consists of a circle of 8 cells connected to each other with lines, and another 9th cell in the center. The game begins with each player having 3 pieces, one side black and the other white. All pieces are off the board. The players decide who goes first by a lot, such as a toss of a coin. The players alternate placing their 3 pieces on any of the 9 cells of their choice. The center cell can be occupied as well. Once all of the 6 pieces have been placed, the players alternate moving them around the circle trying to form a line of 3 pieces in a row, across the diameter of the circle, by occupying the center cell and the two opposing cells on the perimeter. The players cannot jump over the opponent’s pieces and cannot knock them off the board or off of their cell. The pieces can only be moved onto unoccupied cells. Two pieces cannot occupy the same cell. Players cannot skip turns. The first player to form 3 in a row across the diameter wins. Rota is a game of pure strategy without any luck component, since there is no dice of any kind. The player must position their pieces such that they do not get blocked in and yet block the center cell. The player who goes first will naturally always try to capture the center cell first. It is the opponent’s job to try to prevent the first player from positioning the 3rd piece in a row with the other two. The game is relatively short. Rota cannot end in a tie. There is always a winner. 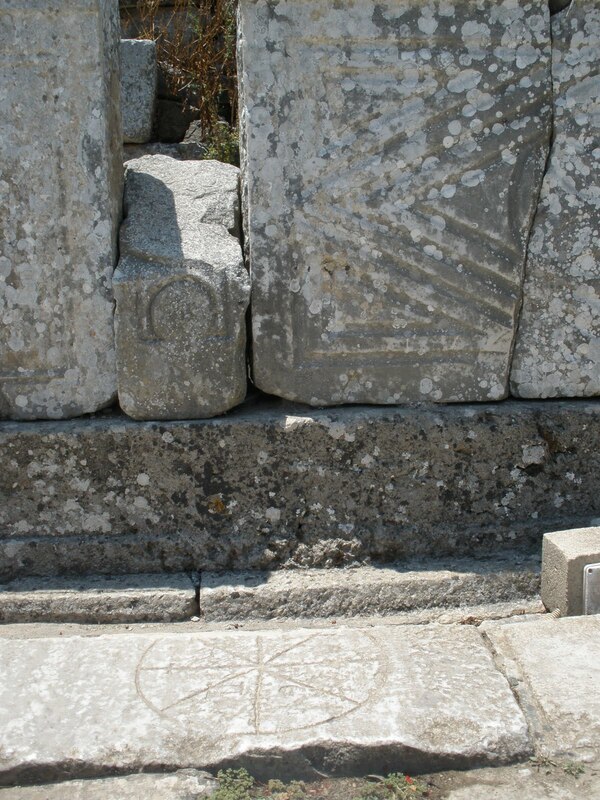 Rota carved into the floor tiles of Via Arcadia in Ephesus, Turkey. Photo: Juan Carlos Campos, July 2011. 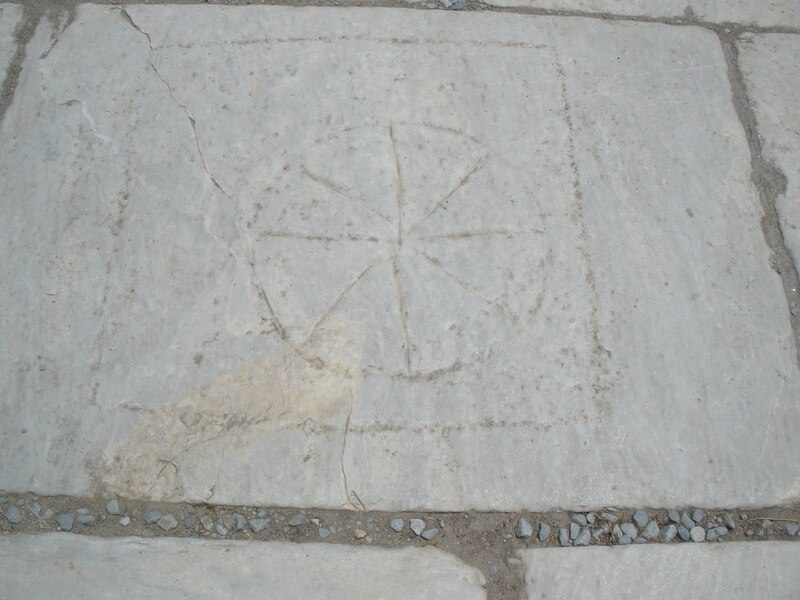 Rota carved into the floor tiles of Via Egnatia road in Philippi, Macedonia (Greece). Photo: Félix da Costa, 2014. Merrill, Elmer Truesdell. “An Old Roman Game.” The Classical Journal 11, no. 6 (1916): 365-366. Thank you for the observation. I have noticed the same thing. Recent research has shown that the game does not work and probably did not even exist. The game is not attested nowhere on the planet. It seems to be an invention by the archaeologists. These wheel patterns have other functions: among which also the one as a board for a tossing game. Ovidius has the square three men’s morris (“alquerque de tres” how it is called by Alfonso X) in mind.